Fireworks are a boldly beautiful way to celebrate many occasions, but consumers should always follow the appropriate safety measures when using fireworks to avoid turning a fun celebration into an emergency. To prevent fireworks accidents, it is crucial to handle the charges safely from the first purchase through the last disposal. 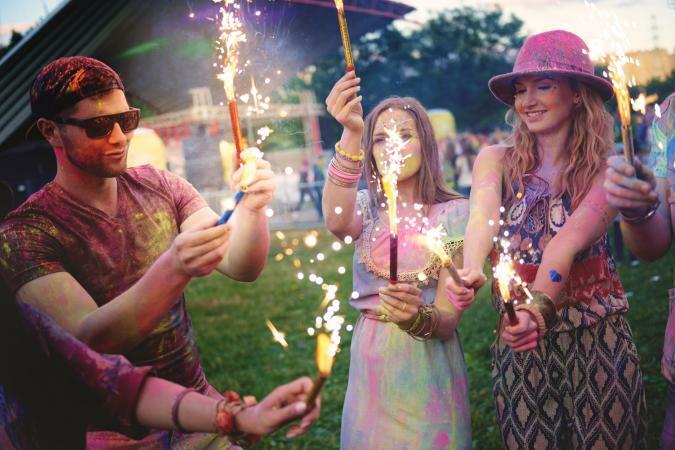 Purchasing appropriate fireworks is the first step toward enjoying their colorful display in safety. Purchase only legal fireworks. What types of fireworks are legal varies from state to state; check local laws for current restrictions. Purchase fireworks from a reputable dealer where they are more likely to have been handled and stored safely. These dealers will have a federal explosive license or permit issued by the Bureau of Alcohol, Tobacco, Firearms and Explosives. Read all descriptions and labels before purchasing fireworks and be aware of any special effects such as launched sparks, color changes, sirens, or spinning, so you know what to expect. Purchase fireworks close to the celebration to avoid long-term storage hazards. Storing fireworks can be tricky. If stored improperly, they could lose their charge, weaken, or even prematurely ignite. Store fireworks in a cool, dry, dark location. Any sort of humidity or water that comes in to contact with the fireworks can cause damage. Fireworks should be stored in a sealed container and never in your home or where people are living. Obey all local laws about where and when to light consumer fireworks; if fireworks are banned, do not light any items. Designate one person to light the fireworks and equip them with safety goggles or other protective clothing. Light fireworks only on a flat, stable surface away from combustible materials such as bushes, dry leaves, grass or brush. Never light fireworks in an empty field. Use a long-handled match or long lighter to keep as far from the fuse as possible. Never alter or combine fireworks in any way, including trimming fuses or cutting away protective packaging. Do not re-light dud fireworks or charges that do not finish their promised show. Keep a bucket of water or a hose nearby in case of stray sparks or other problems. Consider dousing the area around where the fireworks will be lit before beginning to control sparks. Light only one firework at a time; do not attempt to light several to create a larger display. Remove all unnecessary packaging before lighting fireworks. Do not light fireworks under trees or near vehicles, buildings or windows. Never aim fireworks toward people, streets, buildings or other obstacles. Place fireworks on the ground before lighting to avoid accidental hand burns or dropping the firework. Keep spectators at least 20 feet away from the lighting area. Keep pets indoors or away from the lighting area; the loud noises and acrid smells can frighten animals into unpredictable behavior. Do not light fireworks while under the influence of alcohol. Restrict running and horseplay near the fireworks area. Do not ignite fireworks in a container such as a bucket or trash can. Be sure there is adequate light in the firework area to safely see the fuse while lighting charges; use a flashlight if necessary. Do not light fireworks in windy conditions that can affect how the sparks fly or may move the charge unexpectedly. Do not permit young children to handle any fireworks, even sparklers. Always provide adequate supervision when lighting fireworks. Understand appropriate fire safety precautions while lighting fireworks. Let used fireworks cool before handling, or pick them up only with tongs or protective gloves. Douse spent fireworks by soaking them thoroughly in a bucket of water for several minutes to ensure that all embers are extinguished. Larger fireworks may require overnight soaking before you dispose of them. Double wrap the soaked fireworks in waste disposal bags or plastic wrap to keep them from drying out. Dispose of all firework debris, used matches, wrappers, and so on in the trash can to prevent littering and water contamination from gunpowder residue. Thousands of accidents are caused by fireworks each year, from minor burns to severe injuries and explosions. One-third of such incidents are caused by illegal fireworks, and hundreds of injuries are to young children. While taking the proper safety measures can help prevent accidents, it is important to know how to react in case an incident occurs. Hands and eyes are most frequently injured, but prompt treatment can help reduce pain, scarring and trauma. 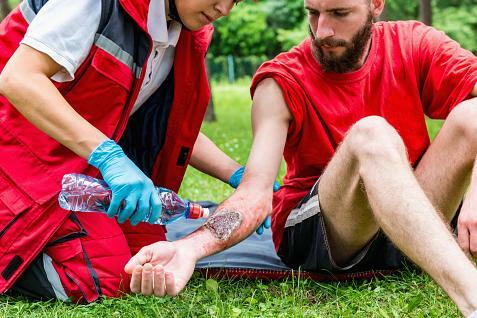 Know basic first aid burn treatment techniques before lighting fireworks. Keep a first aid kit near the lighting area. If clothing catches on fire, remove it promptly. Have a telephone nearby and be prepared to call for emergency assistance if necessary. Do not rub eyes that have been injured by fireworks; instead, cover the eye and seek professional assistance. Following safety measures when using fireworks can keep celebrations safe and enjoyable. For more fireworks safety information, visit the National Council on Fireworks Safety or Phantom Firework's Fireworks University.